In 1938, Lawry's began marketing its seasoned salt in retail stores. This was the beginning of a food products empire that now sells many kinds of seasonings and flavorings under the Lawry's name. These products were sold to Lipton/Unilever in 1979 but were sold to McCormick & Company in July 2008. In 1947 Lawry's moved from its original location on La Cienega to the other side of the street and a few blocks further south, to a larger, mostly windowless, strikingly modernistic building designed by Wayne McAllister. In 1993 it moved back to a new building on the original site. McAllister's building is now occupied by The Stinking Rose, a famous garlic-themed Italian restaurant. In 1956, just prior to the playing of the 1957 Rose Bowl Game between the Oregon State Beavers and the Iowa Hawkeyes, Lawry's entertained the two competing teams. The Beavers were fed at the Beverly Hills restaurant and the Hawkeyes were fed on the Pasadena City College football field following their practice. This started an annual tradition of hosting both Rose Bowl-bound teams for a prime rib dinner, although following the inaugural event with Iowa, the Big Ten teams were served outside Rose Bowl Stadium from 1957-1962. By 1963, when Illinois and Washington both dined at the restaurant on separate nights prior to the 1964 Rose Bowl Game, the two team events had become known as "Lawry's Beef Bowl." A book chronicling the last 50 years of the Rose Bowl Game and the first 50 years of Lawry's Beef Bowl, "Road to the Rose Bowl," was written by Todd Erickson and published in 2005 by Silverback Books (San Francisco). Featuring a foreword by ABC Sports broadcaster Keith Jackson, it has more than 450 photos and recollections from both Rose Bowl players and coaches of the past 50 years. In 1974, Lawry's opened its second location, in Chicago's River North district. Additional locations were opened in Dallas in 1983 and Las Vegas in 1997. Internationally, Lawry's opened restaurants in Jakarta in 1996, Singapore in 1999, Tokyo in April, 2001, Taipei in 2002, Hong Kong in 2006, and Shanghai & Osaka in 2008. Click here to see what we discovered in our garden in front of our home. So cute! In large skillet, heat oil over medium heat. Add chicken, salt, pepper, garlic powder and seasoned salt. Breaking meat up as it cooks, cook until no longer pink. Add onions, cook 3 to 4 minutes. Add cream of mushroom soup. Stir well. Meanwhile, in large pot, add chicken stock, bring to boil, add spaghetti. Cook about 5 to 7 minutes. Drain spaghetti. Add spaghetti to meat mixture. Toss well to combine. Preheat oven to 350 degrees. Spray casserole dish with nonstick cooking spray. Place mixture in casserole dish. Sprinkle cheese. Bake about 15 minutes, until cheese melted. Enjoy! I had no idea that Lawry's has been around for that long! Great recipe! Sounds like easy and delicious spaghetti dish for dinner! We love some Lawry's seasoned salt! Very interesting post. And great pasta! Great history of Lawry's and the Rose Bowl. Who knew? My dad went to University of Iowa and I am going to tell him this story. Great to pop in here and learn some information about Lawrys, pretty cool. Also, I do like this pasta dish, not many out there with ground chicken-very creative! this chicken spaghetti sound Yummy and creamy with these ingredients !! I like to cook this too, yummy! Chciken spaghetti, yumm thats sounds like my type of meal. Interessting that u ground the meat. thx for sharing! 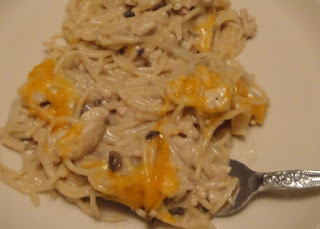 I love chicken spaghetti, it looks so creamy! Your history is so interesting! Funny you mention the Iowa Hawkeyes in the post, as my husband and I are from Iowa; however, we are Iowa State fans:) Thanks for sharing! Congratulations! This post was one of the top 5 viewed posts on Food Frenzy for March 2012. Christine, this looks delicious! I love ground chicken and need more ways to use it. Love that you used ground chicken and I'm a big Lawry's fan! Congratulations! This post was one of the top 5 viewed posts on Food Frenzy for April 2012. This is two month's in a row for this particular post. Great Job!